Note: Inkjet transparencies and vellum paper are not supported. 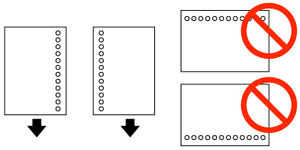 You can load one sheet of binder paper with holes on one of the long edges as shown. Do not select automatic 2-sided printing for this type of paper.